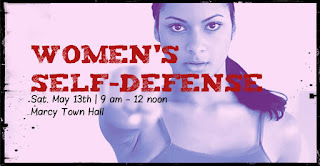 This 3-hour Personal Self-Defense Class is a MUST for ALL women! Taught by Master Instructor, Sensei Dave Bruce of Dave Bruce's American Martial Arts, you'll learn how to how to detect, diffuse and defend yourself. Let's protect ourselves and our daughters, sign-up today! Currently open to MARCY RESIDENTS ONLY. Class space is limited to only 25 participants. This class is for females ages 12 and up. This event will be held at the Marcy Town Hall from 9 am until 12 pm on Saturday, May 13th. Visit the Facebook Event or contact the Marcy Town Hall to secure your spot today!